Claudio Pizarro is helping Johannes Eggestein both on and off the pitch (Photo: nordphoto). The two couldn’t really be more different on the surface. On one side you have Claudio Pizarro; a professional footballer for 22 years, Champions League-winner, six-time Bundesliga champion, DFB-Pokal-winner and Werder’s record-goalscorer. On the other side, you have “Jojo” Eggestein. He’s 20 years old, and has begun his career with one Bundesliga goal in 12 appearances. However, the pair also have some things in common. They’re both in good form and seem to link-up well on the pitch, as recent evidence suggests. Both strikers came off the bench against Wolfsburg earlier this season and Pizarro played Eggestein through for his first Bundesliga goal. Last weekend in Mainz, Jojo returned the favour. Eggestein played the ball into the area where Pizarro was waiting to tap home. 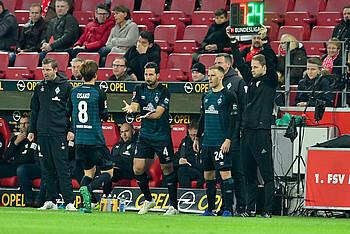 Pizarro assisted Johannes Eggestein's first Bundesliga goal against Wolfsburg (Photo: nph). Following their strong performances off the bench, the question is now whether the duo will start together anytime soon. Head coach Florian Kohfeldt gave his opinion on the matter: “Jojo is very close to starting, but he has been for a few weeks. He’s started to take his chances and earn his place in the squad. Piza always has an effect when he’s on the pitch, whether that’s on the opponent, the fans, or even his own team.” The chance that the two strikers will start together is “just as high as everyone else in the squad,” said Kohfeldt, obviously holding his cards very close to his chest. Eggestein and Pizarro are Werder's perfect super-subs at the moment (Photo: nph). Pizarro and Eggestein, perhaps Werder’s most promising pairing at the moment, are back in action against Borussia Mönchengladbach on Saturday (15:30 CET).